2.5 millions burglaries take place each year in the United States. Here’s how you can prevent your home from being apart of that statistic. Don’t let the statistics scare you, 87% of burglaries can be prevented! Although no home is completely secured from being robbed, knowing about your area, neighbors, and these six simple ways will decrease your chance in becoming the next target. 30% of all burglars enter a home through an unlocked door or window. Reinforcing your doors and windows with deadbolts, steel guards, or even smart locks can help prevent burglars from entering your home easily. Be sure to also secure your sliding doors, patio doors, or other entry ways that burglars can also have access to. Amp up your surveillance by investing in a home security service where you can install cameras, motion detectors, alarm codes, and more. 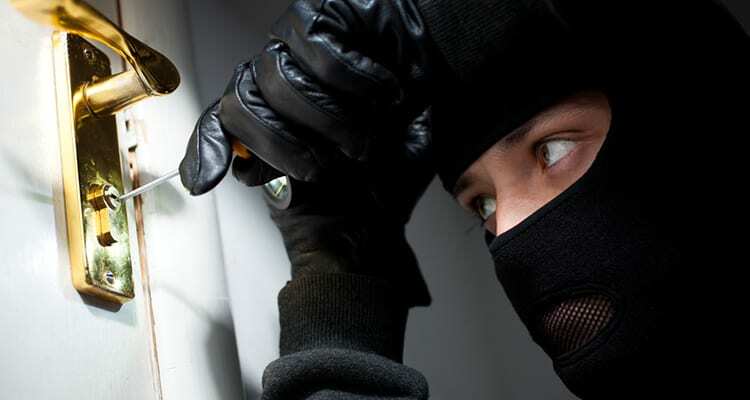 Burglars are intimidated by homes with security systems especially when they see blinking cameras around. Security cameras gives you the power to see and access your home when you’re away. There are also cheaper home security options like basic alarms that emit loud noises when triggers. Never underestimate burglars. Most of them know the ins and outs of robbing a home and won’t waste time with a house that isn’t worth robbing. Usually, they like to scope out homes as their next targets. In this case, use curtains or shutters to hide the interior of your home. Curtains and shutters prevents burglars to see what’s in your home and if they can’t see in, they most likely won’t pursue. Bushes and trees are great hideaways for burglars. Burglars use larges shrubs and hedges to hide from curious neighbors and pedestrians. Be sure to trim large landscaping by keeping hedges less than 3 feet and or use thorny, spiky bushes or plants near windows. It’s better to be safe than sorry by keeping your valuables and important paperwork in a hidden safe. Keeping safes in plain sight and unsecured gives burglars the right of way to take your prized possessions. Make the access of your safe as difficult as you can. Be creative! Allow your neighbors to park in your driveway, tell your friends to grab your mail and newspapers, and continue your landscape services so it looks like someone is home. Planning on being away for weeks at a time? Ask a trusted friend or family member to house sit or simply check on the house from time to time.